^ Osborne, W. Zachary; Pinsky, Lawrence S.; Bailey, J. Vernon (1975). 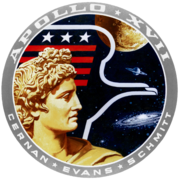 "Apollo Light Flash Investigations". In Johnston, Richard S.; Dietlein, Lawrence F.; Berry, Charles A. Biomedical Results of Apollo. Foreword by Christopher C. Kraft Jr. Washington, D.C.: NASA. NASA SP-368. Archived from the original on September 17, 2011. Retrieved August 26, 2011. ^ Haymaker, Webb; Look, Bonne C.; Benton, Eugene V.; Simmonds, Richard C. (January 1, 1975). 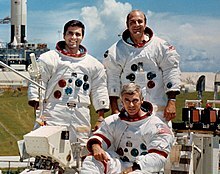 "The Apollo 17 Pocket Mouse Experiment (Biocore)". 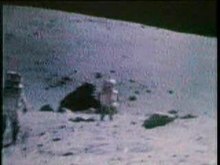 In Johnston, Richard S.; Berry, Charles A.; Dietlein, Lawrence F. SP-368 Biomedical Results of Apollo (SP-368). Lyndon B. Johnson Space Center. OCLC 1906749. ^ "EVA-3 Close-out". 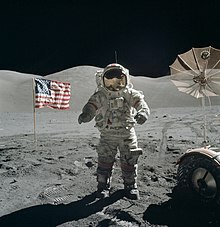 Apollo Lunar Surface Journal. Archived from the original on July 18, 2011. Retrieved 22 August 2011. ^ Neal-Jones, Nancy; Zubritsky, Elizabeth; Cole, Steve (September 6, 2011). Garner, Robert, ed. "NASA Spacecraft Images Offer Sharper Views of Apollo Landing Sites". NASA. Goddard Release No. 11-058 (co-issued as NASA HQ Release No. 11-289). Retrieved July 24, 2013.